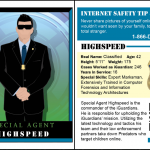 A series of trading cards released by Immigration and Customs Enforcement Homeland Security Investigations in March 2014 intended to raise awareness among children and young adults of issues related to cybersecurity and online sexual predators. When an ICE enforcement activity is determined to be of high risk or sensitive in nature. It may require the use of tactical capabilities beyond those of the typical ICE enforcement officer in order to ensure the safe and successful resolution of the action. Under these circumstances, Tactical Teams possessing specialized skills, specialized equipment and specialized training to meet these particular challenges may be required. The deployment of these teams can be viewed as the use of an elevated level of force. For these reasons, it is important for ICE to have processes and procedures for the establishment and operation of these teams, appropriate training and qualification standards for team members, and very specific reporting requirements through defined reporting channels, for team activities. The SM-CCTV System is a computer network consisting of closed-circuit video cameras, digital video recorders (DVRs), and monitoring capabilities that capture video-only feeds in and around ICE facilities. The purpose of the SM-CCTV System is to help ICE secure and regulate physical access to ICE facilities. The system also serves to enhance officer safety, prevent crimes, and assist in the investigation of criminal acts committed inside and on the perimeter of protected ICE facilities. Video surveillance also supports terrorism prevention and facility protection with its visible presence, and detects and deters unauthorized intrusion at ICE facilities. The SM-CCTV System is planned to be deployed in numerous ICE facilities nationwide. 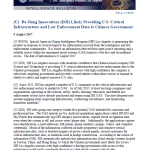 A presentation from U.S. Immigration and Customs Enforcement’s Enforcement Systems Branch on the status of information sharing presented at the 2011 AFCEA Homeland Security Conference on February 23, 2011.